Island Peak is Located on top of the Chukung glacier between Ama Dablam and Lhotse Mountains, Island Peak is the most sought after trekking destination because of its challenging geographical conditions. Each year more than 300 groups attempt to scale the summit of Island peak. 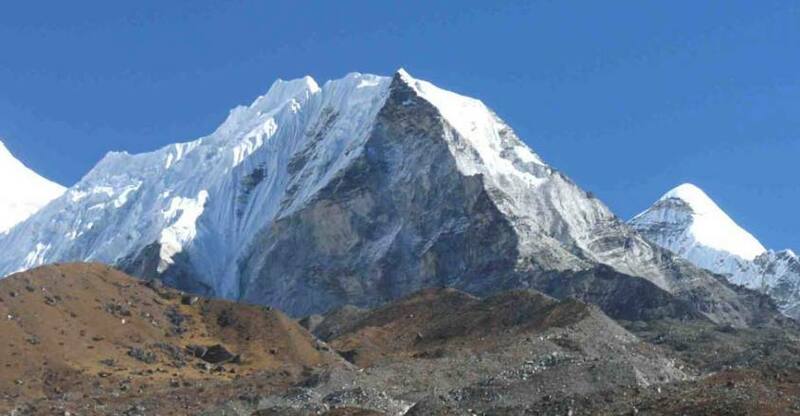 This trek offers an excellent opportunity to climb a Himalayan Summit 6160m. together with an exhilarating Trek to the Everest Base Camp and Kala Pattar. The most difficult section is a mixed rock and ice wall at a slope of around 45 degrees leading to the narrow summit ridge. Day 03: Fly to Lukla and Trek to Phakding 2652m. Day 04: Trek to Namche 3450m. Day 05: Rest day in Namche 3450m. Day 06: Trek to Tengboche Monastery 3860m. Day 07: Trek to Dingboche 4350m. Day 08: Rest day explore to the Chhukung 4710 m. and back to Digboche.4410m. Day 09: Digboche to Lobuche 4910m. Day 10: Lobuche to Gork shep 5184m. Day 11: Trek to Everest Base Camp 5365m, then back to Gorak Shep 5180m. Day 12: Hike up to Kalapattar 5550 m. early in the morning and trek down to Dingboche 4410m. Day 13: Trek to Chukhung 4750m. Day 14: Trek to island peak base camp 5150m. Day 15: Trek to Island peak high camp. Day 16: Submit day island peak 6160m. Day 17: Base camp to Dingboche 4110m. Day 18: Dingboche to Namche 3450m. Day 19: Trek to Lukla 2800m. Day 20: Fly back to Kathmandu. Day 21: Fly back to Home. Professional Climbing Sherpa and treks guide. You will be welcomed by Halesi Treks our representative at Tribhuvan Internationa Airport upon your arrival, then transferred to hotel. A spectacular flight and hair raising landing on a steep mountain runway brings us to the start of our trek at the village of Lukla 2850m. After meeting the crew, we head up the Dudh Kosi Valley on a well-marked trail to our first camp near the river at Phakding. From Phakding, we cross and re-cross the river on high suspension bridges. Beyond Monjo is the entrance to the Sagarmatha National Park which was set-up in order to protect and preserve this fragile mountain environment. We then ascend quite steeply to Namche and along the way, if the weather is clear, catch a first glimpse of Mt Everest in the distance. Namche is the main trading village in the Khumbu and has a busy Saturday market - a meeting place for the Hindu traders from the lowlands and the Tibetan yak caravans that have crossed the glaciated Nangpa La. Namche is tucked away between two ridges amidst the giant peaks of the Khumbu and has an abundance of lodges, tea shops and souvenir shops as well as a magnificent outlook. It is an ideal place to spend a rest day, acclimatizing to the new altitude before heading off towards Tengboche. Options for acclimatization walks include a visit to Khunde hospital which was set-up by Sir Edmund Hillary, or a one hour walk up to the Everest view hotel above Namche for the sunset view of Ama Dablam, Nuptse, Lhotse and Everest. There are also good views from the national park centre and museum just above the town. The trek continues along the rushing glacial waters of the Dudh Kosi with magnificent views of the mountains. We trek to an altitude of 3860m.today. On reaching Tengboche you will see the local monastery. Inside the monastery are incredibly ornate wall hangings, a 20-foot sculpture of Buddha, and the musical instruments and robes of the Lamas. The group will be taken to observe a prayer ceremony either in the evening or morning depending on how the days trekking went. From Thyangboche the trail drops to Debuche, crosses another exciting suspension bridge on the Imja Khola, and climbs to Pangboche amongst thousands of mani stones. Our uphill trek continues, taking us to the quaint traditional Sherpa village of Dingboche with its exquisite views of Lhotse, Island Peak, and Ama Dablam. We take our time so we avoid getting affected by the altitude. Today you can enjoy another day for acclimatization. We will have trip to Chhukung valley via the Imja Khola valley to get a marvellous view of the surrounding mountains, especially Lhotse’s massive south wall, then return to Dingboche in the evening. Today, the trail continues along the lateral moraine of the Khumbu Glacier and passes by stone memorials for climbers who have perished on nearby summits.We continue to climb as we are heading to the altitude of 4910 meters at Lobuche which is really just a few huts at the foot of giant Lobuche peak. Some breathing problems may arise today due to the altitude. While enduring a climb of approximately two hours and arriving at Gorak Shep, trekkers are treated to yet another beautiful view of Mt. Everest and Pumori â€“ reaching Kala Patthar (within two hours of trekking). Once observing one of the most up-close and formidable views of Mt. Everest from Kala Patthar, treks return back to Gorak Shep for an overnight stay. This is another big and difficult day walk along the Khumbu Glacier and up to Everest Base Camp at 5365meters. , the closest you can get to Mt. Everest without mountaineering equipment. There will likely be a team there about to attempt the summit. The view of the Khumbu Icefall from Base Camp is spectacular. return back to Gorak shep for the night. This will be one of the most difficult yet rewarding days of the trek. Most of morning in this day is spent climbing Mt. Kala Patar, a small peak (by Himalayan standards) at 5550meters. 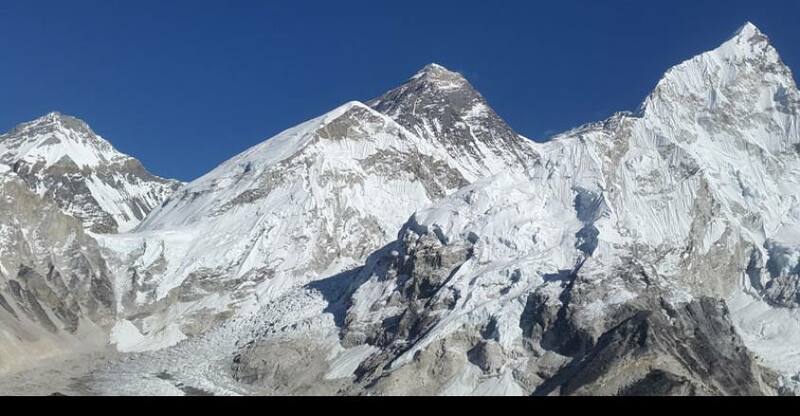 The ascent is demanding but the climber gets the most magnificent mountain panorama: Everest, the highest point on the planet at 29028ft, 8848meters, towers directly ahead and on all sides loom the other giants, Nuptse, Pumori, Chagatse, Lhotse and countless others. We make a quick descent to Gorak Shep, a tiny hamlet at 5180 meters then trek down to Dingboche. Today, we have an easy walk for about 2 hours, climbing up gradually to the small settlement of Chukhung. Along the way we have great views of Island Peak and the challenge that awaits us. Another easy day, the trail crosses the river and follows the valley for approx 3 hours, passing beneath the magnificent south face of Lhotse. Base camp is by the side of the Imja glacier, below steep grassy slopes which mark the start of the climb on Island Peak. We ascend a little further to high camp where we will relax and make final preparations for our climb tomorrow. Crossing the gully above the camp the trail makes a climb for another hour to a narrow ridge, leading on to the glacier. Here it is time to rope-up and put on our crampons as the most interesting part of the climb begins with the glacier crossing. This is followed by the steep snow slope that leads onto the summit ridge. This ridge is wonderfully airy and on reaching the summit we have stunning close-up views of the south face of Lhotse looming over us whilst in the other direction, there are more dramatic mountain views. We descend along the same route, down to base camp. After descending along the trail to Chukhung, we continue on to Dingboche , we will spend a night in Dingboche. Today we follow the river and, after crossing it, climb back up through birch and rhododendron forest to Tengboche. Kwangde, Tawache, Everest, Nuptse, Lhotse, Ama Dablam, Kantega and Thamserku are just a few of the Himalayan giants to be seen. From Tengboche we descend to the bridge over the Dudh Kosi at Phunki Tenga, where there are water driven prayer wheels, before making our way back to Namche. Our final day's trekking follows the Dudh Kosi back down to Lukla. This last evening in the mountains is the ideal opportunity for a farewell party with the Sherpa guides and porters, where we can sample some CHANG[ Local Beer] RAKSHI[ Local home made wine] try a memorable trekking experience. We pack up early and head for the airstrip for the flight back to Kathmandu. This is your final day, Halesi Treks Pvt.Ltd transfer to airport Fly back to home. Kathmandu - Lukla - Kathmandu flight may be delayed by few hours or even cancelled due to bad weather condition. So, you should be prepared for such flight delays or cancellations. But we will do our best to avoid such conditions. In case of flight cancellation, we will try to get you on the flight for the next day. Getting early flight for the next day may not be possible during the high season so, we can arrange flight by helicopter as well but it will be extra cost. If we have a group of 4- 5 people, we can charter a helicopter from Kathmandu – Lukla. It will be advisable to have extra days in Kathmandu before and after the trekking. We can arrange you cultural / adventure tours (such as sightseeing tours, rafting, jungle safari, with extra cost if the extra days are not used for the flight conditions to Lukla and back. If the flight is delayed and cancelled for several days which could disturb your onward journey, you are free to choose trekking in Annapurna, Langtang and other regions and we are Halesi Treks arrange the alternative trek.